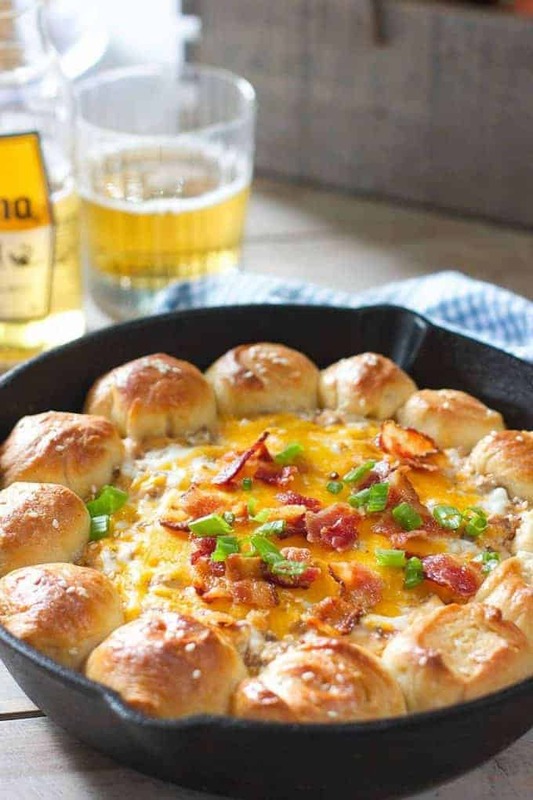 Double Bacon Cheeseburger Dip with Mini Buns! This super easy to make appetizer will be the hit of your next party! Burger, cheese and bacon…all mixed up with even more ooey gooey cheese and bacon. Then circled with mini buns. Buns that are made out of store bought french bread dough! The kind you find in a tube, in the tube bread section. I know, there shouldn’t be a tube bread section but there is! It’s where the crescent rolls and biscuits live. All happy in their cold case just waiting to be dipped in some cheeseburger goodness! 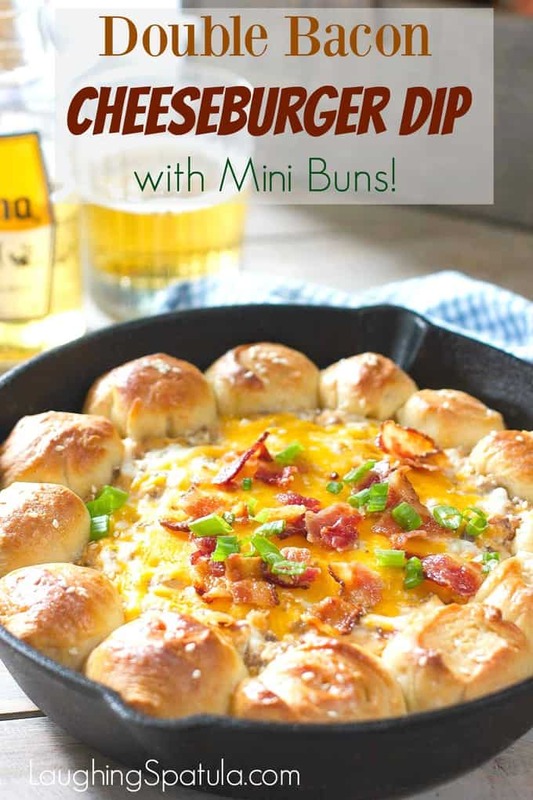 How to make Double Bacon Cheeseburger Dip with mini buns! This is such an easy appetizer to make. Brown your beef and crisp up your bacon. I cook my bacon in the oven BTW. Simply line a sheet with foil and slap on the bacon. Bake at 400 degrees for about 20 minutes. No splattering, no stinky kitchen and the bacon comes our perfect! You can also just sizzle it up in the skillet before you brown up the ground beef. Your choice to splatter, or not to splatter! Once you brown up the beef, onion and garlic, just let it cool down for a few minutes. 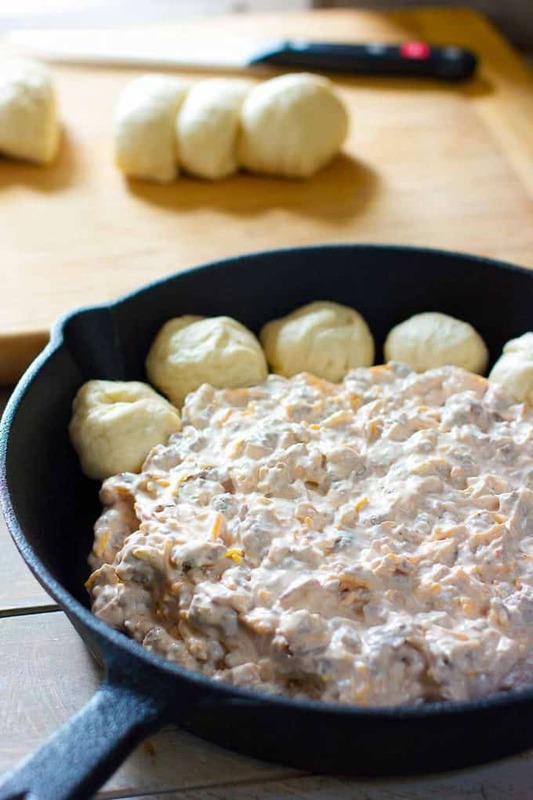 Mix up all your cheeses, toss in the beef and mound in the middle of a round casserole or cast iron pan. Open your ‘tube-O- bread’ :). Cut into 12 equal slices, roll and circle the yum. I left a slight edge around the pan for the buns. You can make the filling a day or two in advance and just top with the bread right before baking. Thats about it guys…not much too it! I used 90/10 lean ground beef. But any will do. You are going to have to dump the remaining grease before adding the cheese so you might as well make it easy on yourself and go lean. For easy clean up, oven bake your bacon. Foil line a large baking sheet and bake on 400 degrees for about 15-20 minutes. Let the grease cool and then just wrap up the foil and toss. I used a French Bread Loaf (Pillsbury) but the biscuits or even the crescent roll chilled dough would work. This reheats really great…even in the microwave. You can see all my Appetizers here! To ooey gooey cheesey dip! You also might like this Artichoke, Feta and Jalapeno Dip Stuffed French Bread! 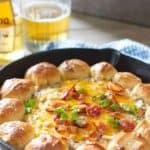 Easy to make Double Bacon Cheese Burger dip with Mini Buns! The buns are simply store bought dough...so easy! 1 cup cooked crumbled bacon (about 1 pound), with a pinch set aside for garnish *see bacon cooking tip above in Notes. pinch of salt pinch of pepper...taste. Does it need more? In large skillet cook ground beef, onion,garlic, salt and pepper until beef is cooked through and onion is soft. Drain and cool for about 15 minutes. In separate bowl, combine 3/4 cup of the grated cheese, bacon, cream cheese, mayo, sour cream, ketchup and worcestershire sauce. Add ground beef to cheese mixture and combine. Mound in center of a 2 quart baking dish or skillet. Cut french bread loaf into 12 equal slices and roll into balls. 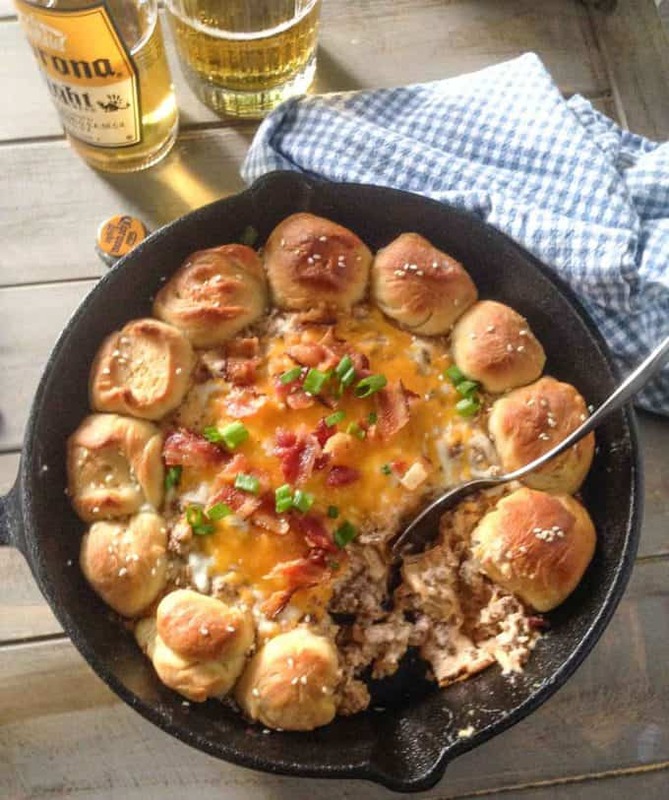 Set balls of dough around beef and cheese mixture. Bake for 20-25 minutes or until center is bubbly and bread is golden brown. Top with remaining 1/4 cup of cheese and a sprinkle of bacon. Return to oven for 3-5 minutes or until melted. Optional: brush bread with a bit more melted butter and sprinkle on sesame seeds for garnish. A recipe worth trying, but toss bacon fat? You can’t be serious!!! Can one sustain life on just this? And maybe a cocktail? Because I’m seriously considering trying. Looks SO dang good! Well if one could….one should! Thanks for the nice note Karly!